1. In small bowl, whisk together shallot, 1/3 cup oil, vinegar, tarragon and mustard; set aside. In large nonstick skillet, heat remaining 1 tablespoon oil over medium-high heat until very hot but not smoking. Add scallops to skillet; sprinkle with salt and pepper. Cook 4 to 6 minutes or until golden brown, turning once. 2. 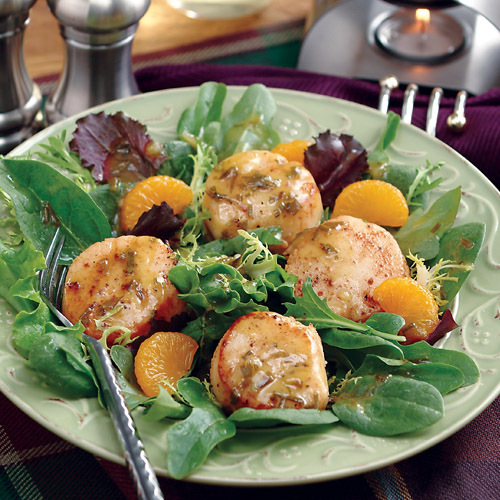 To serve, arrange salad greens on each of 4 dinner plates; top with scallops and orange segments. With spoon, pour vinaigrette over salads to serve. Remember to always pull off and discard the tough crescent-shaped muscle from the side of each scallop.